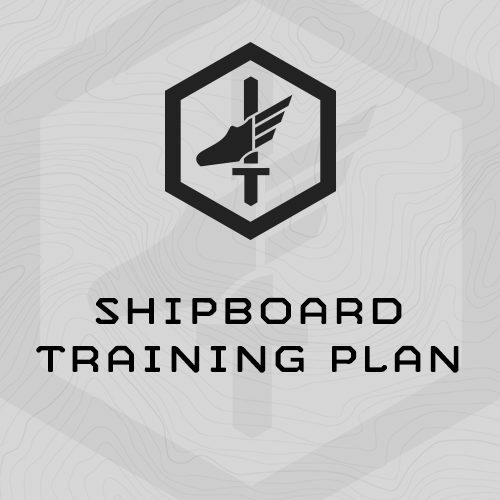 The Shipboard Training Plan is designed for military athletes deployed for extended time, aboard ships – Navy personnel, deployed Marines, etc. This is a limited equipment training program, recognizing the limited equipment and space available for training aboard most vessels. Full Set of Dumbbells or Kettlebells – These will be the primary strength training tool for this plan and they are interchangeable. The plan lists dumbbells and prescribes loading in pounds. If you are using kettlebells, use the equivalent kettle bell size – for example instead of 25# dumbbells use 12kg kettlebells, for example. 20/24” box for box jumps. Again, be resourceful – a pelican box will work. Optional: treadmill for running (For the endurance sessions/events in this plan, you are given a choice between step up/shuttle combo, treadmill run, or just step ups. This is an intense, 6-week, 5 days/week, 30x Training Session cycle. We recommend you train 5 days in a row, and take 2 days off, total rest while completing this training plan. This training plan is a truly “Fluid” cycle which will combine in nearly equal parts strength, work capacity, endurance, and Endurance sessions into a 6-week cycle. Full Set of Dumbbells or Kettlebells - These will be the primary strength training tool for this plan and they are interchangeable. The plan lists dumbbells and prescribes loading in pounds. If you are using kettlebells, use the equivalent kettle bell size - for example instead of 25# dumbbells use 12kg kettlebells, for example. 20/24” box for box jumps. Again, be resourceful - a pelican box will work.